Ohio Citizens for the Arts Foundation has released the results of a study developed in conjunction with the Center for Regional Development and Bowling Green State University that shows the true power and impact of Ohio’s creative industries. 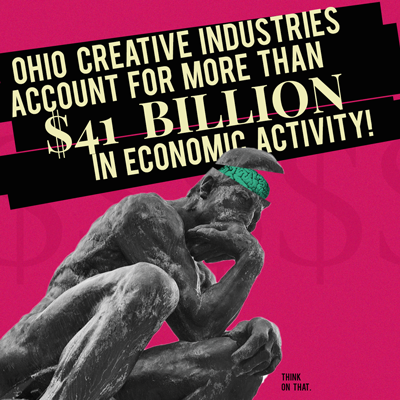 The report proves that Ohio’s creative industries are much more than regional amenities. In short, they are powerful economic engines. Key findings from the report show that the arts in Ohio have experienced significant growth in the past few years and now account for more than $41 billion in economic activity while supporting nearly 290,000 jobs annually. Additionally, the arts and creative industries generate over $4.5 billion in federal, state, and local tax revenue annually. 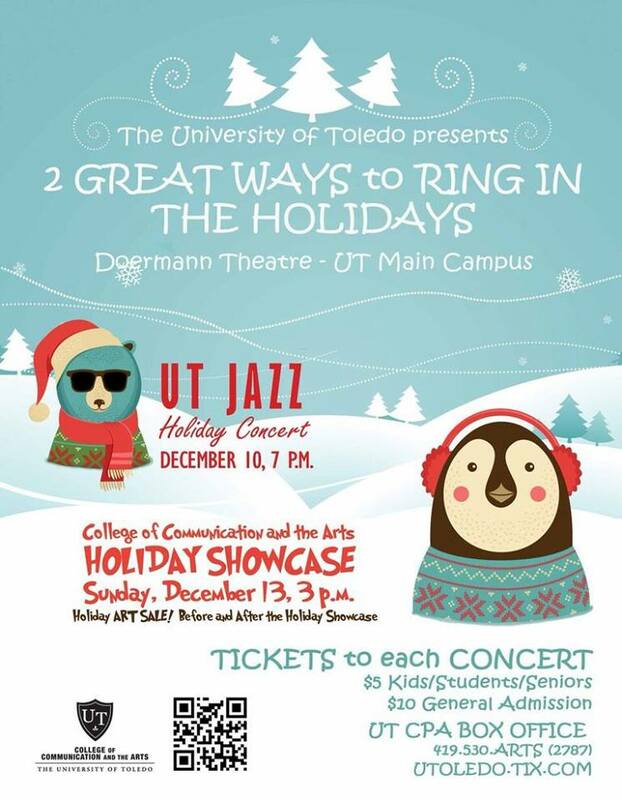 The UT Department of Music warmly invites you and your family to join us for one or both of two amazing holiday concert events! Thursday, December 10 at 7 p.m., the UT Jazz Holiday concert—an annual favorite—will feature performances from all of the UT jazz ensembles, as well as special guests. The program includes a large selection of the best holiday jazz tunes. Come a little early to the concert to take photos with Santa and Mrs. Claus! Bring your cameras. Then Sunday, December 13 at 3 p.m., the College of Communication and the Arts celebrates the season in style with its Holiday Showcase, a concert combining the musical with the theatrical. The concert is about one hour and 15 minutes and is perfect for the very young and young at heart. This concert also includes an appearance by Santa for photos with you and yours. The students of the Art Department will hold a Holiday Art Sale before and after the CoCA Holiday Showcase concert. They will be selling student artwork, ornaments, pottery, jewelry and cards—perfect for holiday gift-giving. There will also be Art Department t-shirts and tote bags for sale. They will be happy to hold your purchases for you until after the concert. Proceeds from the sale benefit the students directly and will be used to cover the costs of student travel and scholarships. Both concerts will be held in Doermann Theater in UT’s University Hall (the building with the University’s signature clock tower). Free parking is available in the lots nearest to Doermann (Area 13 and Area 1N). Plus, golf carts will be on hand to give you a lift to the door. Tickets to either concert are $10 each and are just $5 for students, children and seniors. They can be purchased at the door or in advance through the UT Center for Performing Arts Box Office. Call 419.530.ARTS (2787) or go online to www.UToledo.Tix.com. I hope you’ll join us this holiday season for one of these great concerts! For more concerts and events visit utoledo.edu/CoCAevents.